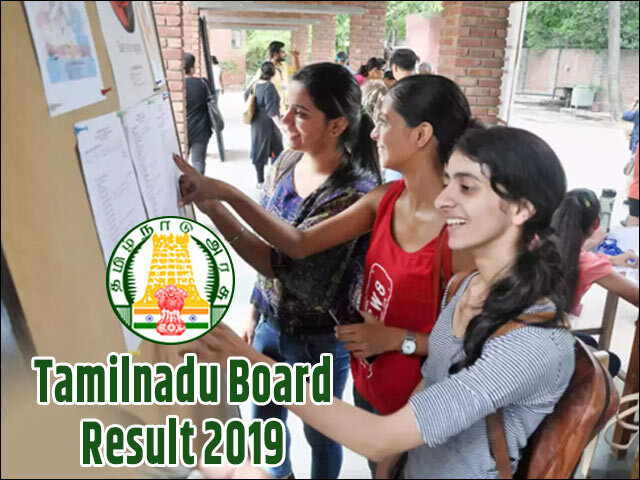 Tamil Nadu Board Result 2019: TN Board result 2019 for Class 12 has been declared at 9.30 AM today on the Board’s official website. The Directorate of Government Examinations, Tamil Nadu has declared the Tamil Nadu Board HSC result 2019 for over 9 lakh students. Students were easily able to access their TN Board 12th result 2019 on tnresuls.nic.in. The Directorate of Government Examinations, Tamil Nadu in their latest press release on 13th April, 2019 had also mentioned the release date for TN 10th result 2019. According to the press release, the Tamil Nadu Board SSLC result 2019 will be declared on 29th April, 2019. Students awaiting their TN Board Class 10 result 2019 will be able to check the same on the official website of the Board. Once announced, links to Tamil Nadu Board 12th Result 2019 and Tamil Nadu 10th result 2019 will also be available on this page. In addition to this, students will be able to find all the latest news and updates about the upcoming TN Board Results 2019 on this page. Concerned students can also register their email id and mobile number of this website to get these updates via Email. Tamil Nadu Board 12th result 2019 has been declared on 19th April at 9.30 am. As per the latest directives from DGE, the Tamil Nadu Board SSLC result 2019 is expected to be announced on 29th April, 2019. The Tamil Nadu Board are released earlier than usual this year. DGE strives to deliver the TN Board result on time so that students do not face any delay while applying to higher courses of study. Looking at the key statistics and numbers from the previous year is a good way to prepare for the upcoming Tamil Nadu 10th Result 2019 and Tamil Nadu 12th Result 2019. This gives students a rough idea of the competition as well as helps them gauge their performance and build realistic expectations for the TN Board Results 2019. If we were to consider the previous year result trends, experts and students in general are expecting a better performance this year too. We hope students make their state and guardians proud this time too. How to check TN Board Results 2019 Online? Students can check their results from the official website (tnresults.nic.in), once the results are declared. Jagranjosh will also provide the direct link to TN results website on this page to help students check their results easily. Students can download the results in three simple steps by visiting the Jagranjosh result page and providing their respective roll numbers. The steps to download the Tamil Nadu board result are listed below. Once candidates click the submit button after entering their roll number in the field provided, they will be able to see the TN Board result. Candidates should download the copies of Tamil Nadu board 2019 result in soft copy and should take out printouts too for future reference. It is noteworthy that the online result is considered as the provisional result by many colleges and schools for admissions. Students though have to produce the original document at the time of verification. What after Tamil Nadu 10th and 12th Result 2019? Once the Tamil Nadu Board Results are announced by the Tamil Nadu Directorate of Government Examinations (DGE), the Board will also make the original marksheets for the Class 10 and Class 12 Board Results available to the students. Students will have to collect the original marksheet for TN SSLC Result 2019 and Tamil Nadu HSC Result 2019 from their respective schools. The Tamil Nadu Board Result printouts or digital copies downloaded from any website will not be accepted by any college for admission to any courses. While collecting their marksheets, students must verify and crosscheck all the personal details as well as the marks against the result checked online. In case of any discrepancy, the same has to be brought to the notice of the relevant authorities. Many students who receive their Tamil Nadu SSLC Result for Class 10 and TN HSC Result 2019 for Class 12, may not be satisfied with the marks they have been awarded. If you really feel that you deserved more marks and that your answer sheet needs to be rechecked or re-evaluated, you can apply for re-checking and re-evaluation process. The notification detailing the process for rechecking and re-evaluation of TN Board answer sheets will be issued by the Board post the declaration of the results. Candidates can visit the board website to find more information about this process. For those candidates who have either failed in one subject or want to improve their score to get into a good college, the TNDGE or the Tamil Nadu Board will conduct supplementary exam for compartmental exams. The TN Board Compartmental Exam 2019 will be conducted mostly in the month of June – July and Result will be announced soon after that. Candidates can contact their respective schools to find out more information about Compartmental exam result. Established during the British era in 1910, the Tamil Nadu Board of Secondary Education (TNBSE) is the highest authority in the state that looks after the propagation, development and maintenance of school level education in Tamil Nadu. Later on, the Directorate of Government Examinations was also formed under the aegis of Department of Education, Government of Tamil Nadu to conduct the SSLC level Board Exams for Class 10 students and HSC Exam for Class 12 students. Currently, the TN Board has around 30,000+ affiliated schools which operate under its guidance. Every year, the Tamil Nadu Board organizes SSLC / Senior Secondary Leaving Certificate Examination for over 9.5 lakh students in the month of March and declares the TN SSLC Result in the month of May. The Directorate of Government Examination Tamil Nadu (DGE TN) has declared the datesheets for class 10th and 12th exam 2018 on their official website i.e. dge.tn.gov.in.